Infrastructures Design and for Constructions. M3 framework is a powerful, flexible and stable software platform where fulfill products and services. Watch the video: "User Interface"
The ergonomic and refined Interface is focused on the user’s experience. and the access to features is natural and more intuitive. Watch the video: "Graphic engine"
A special flexible and very high-performance 3D graphic engine. even with huge quantities of vector data and images. A stable base for your projects. in order to minimize the used space. SmartSave, which avoid the loss of information in case of unexpected stop of the software (for example a blackout). Everything you need without waste. (2GB for Windows 32bit and 64GB for Windows 64bit). It has an optimized management, which uses just the necessary memory and free memory as soon as possible. in order to make the most of the resources of the computer. M3 framework is international by nature and manages different languages and several units of measure. as Japanese, Chinese, Hindi, Arabic, etc. It is possible to choose from different languages among the Interface, the design data and the reports. work with your favorite language and choose the one requested by the client for the finished work. guidelines and tools used for the BIM (Building Information Modeling). adapting it to the workflow requirements and defined standards. 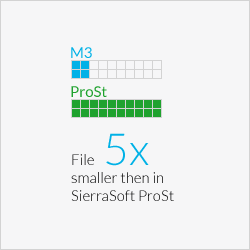 The BIM exchange function is only available as part of SierraSoft Subscription. Learning tools are included in the M3 framework. The Smarthelp guides the user while working with the software by providing context-sensitive information. The user guide of the product is integrated in the Interface through retractable control panels and always available. (Windows 10, Windows 8 and Windows 7).